Baked macaroni and cheese can signify food other than casserole. It may be shaped into attractive, tasty cupcakes, frosted with mashed potatoes, and topped with cherry tomatoes. Baked macaroni and cheese can be cooked in oblong or round casserole dishes. Each serving then is portioned with a serving spoon. An equally tasty and visually appealing cupcake variation offers the additional attraction of preportioning. As with its casserole equivalent, this recipe is open to endless variations in additional ingredients and seasonings. The mashed potato frosting also may be enhanced with favorite seasonings. It even may undergo visual changes through artificial or natural food coloring. The recipe is easy to make, fun to look at, tasty to eat, and welcomed by all ages. Food coloring or natural coloring, such as beet juice, may be added to mashed potatoes for colorful topping. Preheat oven to 375 degrees F (190 degrees C or Gas mark 5). Line 12-cup muffin pan with foil liners. Note: Be sure to remove any paper liners, because they only serve to separate foil liners in the retail package. 1. Bring a pan of water to boil. Then add macaroni and cook until tender but still firm, usually about 5 to 7 minutes. Drain macaroni into colander and return to pot. 2. Place pot on burner at medium heat and add 2 cups shredded cheddar cheese, stirring until almost melted. Leave on burner but turn off heat. 3. In a small bowl, beat eggs into milk. Combine eggs-milk mixture with macaroni and cheese, making sure to mix well. Ladle into muffin foil liners. Sprinkle grated Parmesan cheese over each cupcake. 4. While cupcakes are baking: prepare mashed potato frosting. In a pot filled with water, boil Yukon Gold until tender, about 15 to 20 minutes. Drain into colander and then return potato pieces to pot. Add cream cheese and mash well. Add shredded cheddar cheese, nutmeg, and white pepper. Gently fold. 5. When cupcakes are done: remove muffin pan from oven and place cupcakes on serving platter. Spoon mashed potato frosting into pastry bag and pipe onto tops of macaroni and cheese cupcakes. 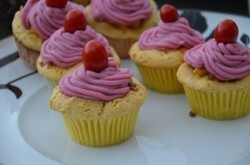 Garnish each cupcake with a cherry tomato. Serve and enjoy! Green onion curls splash colorfully against mashed potato frosting and contribute flavorfully to the satisfying taste of these cupcakes. Further creativity abounds for coloring the frosting, if desired, with food coloring or natural coloring, such as beet juice. Eating/Chewing Muffin and Cupcake Wrappers ! Do you chew cupcake or muffin wrappers? 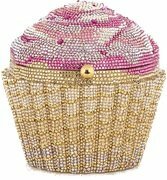 100% Authentic Judith Leiber Strawberry Cupcake Crystal Handbag Minaudiere. Adds a sparkling touch to any special occasion. 4.25 x 3.5 x 3.5 inches. Margielynn, It's a crowd-pleaser for looks and tastes. This is so neat, I have never seen anything like this, I bet kids would love them, us adults too! aingham, The first bite into a macaroni and cheese cupcake definitely qualifies as unexpectedly weird. The second bite and all those that follow will most definitely qualify as wonderful. They're habit-forming. Wow! These are really interesting. It's definitely something to put on my list to try. I always believe that everything needs trying at least once when it comes to weird and wonderful recipes. 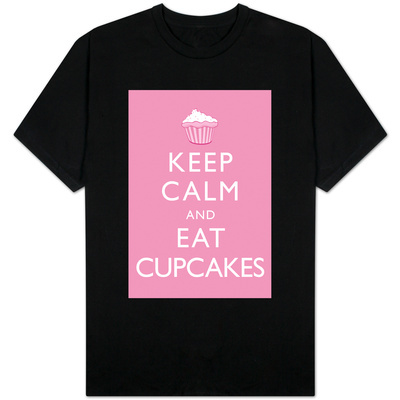 JoHarrington, It is most interesting to watch first-time eaters grab the cupcake, take a big bite, get a momentarily questioning look, and then have at the rest. Macaroni and cheese fans will not feel betrayed, even though sugary cupcake eaters will definitely be having second thoughts about what constitutes a really good cupcake. This is such a novel idea. I love it! Generally made with Cheddar, baked macaroni and cheese casserole can be a main or side dish. This recipe uses both Cheddar and macaroni's historic cheese of choice: Parmesan. Italian bread can be eaten in bite-sized chunks or politely cut slices. Either way, it also can be slathered with butter or topping. Featured is a recipe for plum tomato topping.